Its name is a mouthful, but so is the cigar. 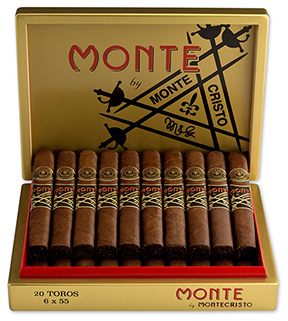 Monte by Montecristo AJ Fernandez joins the expanding number of amazing cigars born from exciting collaborations under the legendary Montecristo moniker. Blended by the Grupo de Maestros and A.J. Fernandez, these premium cigars are expertly hand rolled and box-pressed at the Tabacalera AJ Fernandez Cigars de Nicaragua factory. An impeccable dark chocolate colored Ecuadoran Habano wrapper covers Nicaraguan Criollo '98 and Dominican Piloto Cubano filler tobaccos bound in Nicaraguan Criollo '98 leaf, delivering a smooth and flavorful medium- to full-bodied smoke with big flavor notes of coffee bean, spice, pepper, caramel, chocolate, nuts, toast and cedar, while hints of licorice, cloves, and dried fruit will surprise and please your palate.